I love to hear Glacier National Park trip stories and Nicole Whittington has a doozy. Here’s her story in her own words. Make sure you check out her trip pictures on Flickr. 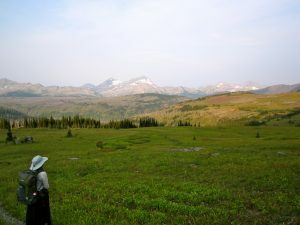 “We didn’t end up getting to the park and thus the back country office until around 9 and when we tried to switch, everything else was already full. So we stuck with flattop/50 mtn/flattop and we were happy we did. We delayed our start time so we could call granite chalet to check for cancellations and we got really lucky and got a room for the third night of our hike. So we got to hike the upper highline, which was amazing, and got to stay in the chalet.